Being surrounded by five young African men trying to scam you of $950 is a little daunting and maybe worth a quick recount here to better prepare other traders. This was a Wednesday night at the Hawkers Market (last night) when a well dressed, well spoken young man of African descent started chatting about his love of craftwork. He was joined by four of his mates, all well dressed and well spoken, and he decided to purchase a $95 product but his mate was going to pay with his credit card. I packaged the goods, entered the details on my mobile EFTPOS machine and handed it to the card holder. It was then that I was distracted by one of the group claiming he had “accidentally” broken a fitting on one of my model ships. I returned to the counter and found the transaction had been completed with a receipt print out. All good? - not really. Lesson Number One - never let your EFTPOS machine out of your sight. The cardholder suddenly discovered there was an error on the receipt. It showed $950 and, you guessed if, he was seeking a refund of the difference between $95 and $950. One of the group said he had an uncle with a milk bar and knew how to generate a refund if I needed help. Now some of you are saying surely you had read the signs of a scam before this but on a busy Wednesday night there are lots of distractions. By now I knew I was in the middle of a scam and fortunately did the right thing and rang my CBA EFTPOS service. The perpetrators insisted I didn’t need to seek bank approval for a refund but I told them that mobile EFTPOS machines couldn’t issue a refund without phone approval (a little white lie). During the phone conversation I asked the customer for a look at the card to verify name and signature, and that is when the five hastily left. 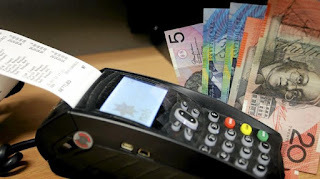 Lesson Number Two - if in doubt, ring your EFTPOS provider. They know how to guide you in this situation. So, no goods changed hands and the bank will reverse the $950 - all good. And I probably learned two more lessons. Firstly you can feel a little lonely in a crowd of 20,000 + people when you are surrounded by scammers, and secondly, seeking help from official sources is a great way of gaining control. The number for my EFTPOS service provider is now readily accessible on my phone.